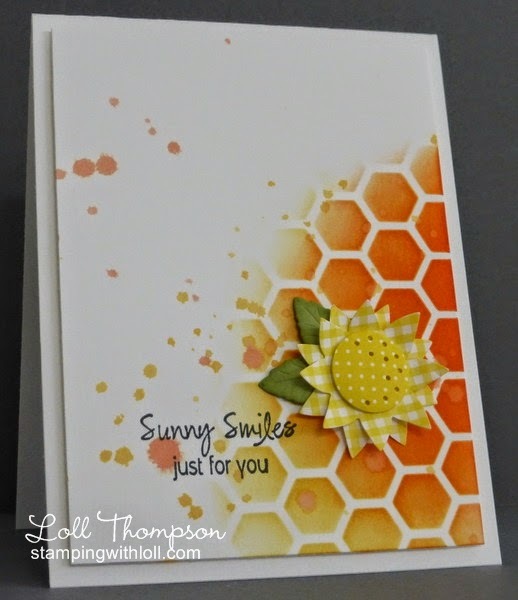 Stamping with Loll: Sunny Smiles for You! I made a sunflower from yellow gingham and polka-dots paper - so cute. I added a little shading on the leaves to bring out the color. I'm sharing more Design Team cards from my time on the Dirty Dozen. The cards I'll be sharing over the next few weeks are from last November so there are several fall themed cards. The theme for the Fan Club Challenge last November was "Grateful". both your cards are wonderful - the gingham flower is a perfect accent and your watercolored leaves with the wood background is great - pinned them both! I also Loved Linda's card and now yours my friend. Love how you added the splatters on your new and old card. I think maybe you got my creative juices flowing again. After having such a FUN birthday luncheon for 8 friends including me and our Birthday Girl Daisy, who turned 85 on Wednesday I have been winding down. But then I got all my digital pictures cropped, etc and had 28 really cute pictures so......Now I am working on a Shutterfly Photo Book for Daisy. She was teary and or smiling the entire time. I got some great pics inside and outside. WE all worked together at the same clinic for years and have remained friends getting together for Daisy's B-day every 5 years, since she turned 60 :-) Daisy said, " This was the BEST Birthday EVER!" I think we would all agree. Now you know why I have been MIA too :-) I do have a card honoring Queen Peggy to post soon. Hugs and TFS your beauties Loll. Two gorgeous cards Loll. Absolutely love those sunshiney colours in your first card......makes me happy! Beautiful summery flower, Loll, with a lovely sponged background. 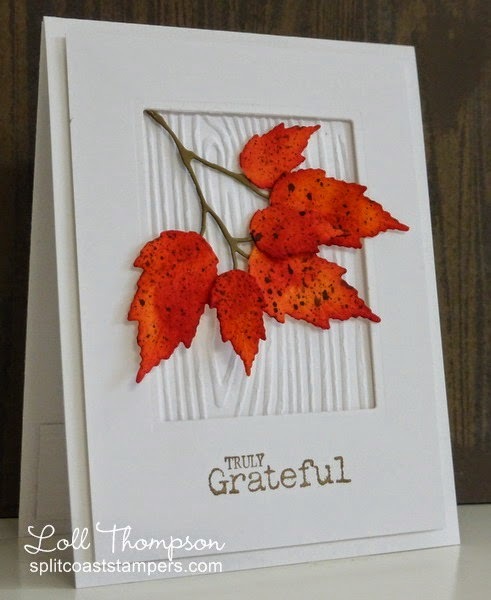 And I really love your Dirty Dozen grateful leaves card - perfect with the brown splatter! Both of these cards are absolutely stunning, Loll!!!! Beautiful!! What a great CASE on the sunflower card, love the colours and the matching sentiment. You will soon be hooked on the DIs, they are invaluable. I was going to get the sets of small ones but had at least one out of each set so will have to get the big ones instead! Oh that CASE is beautiful, Loll! Love the colors and that amazing sunflower! And your DD card is so pretty...love those leaves!